Google upgraded Google Earth to version 6.2 displays the Earth's surface in smooth, natural textures. Previous versions of Google Earth rendered maps in patchy long-range imagery that were stitched together one square at a time. The Google Earth update is available now for download for both the mobile and desktop versions of the software. The Google Earth representation of Earth is put together using satellite and aerial photos taken on different dates, under different lighting and weather conditions, which creates the quilt effect on views of the Earth from high altitude. The images appear patchy unless you zoom in to see a patch represented in a single image. 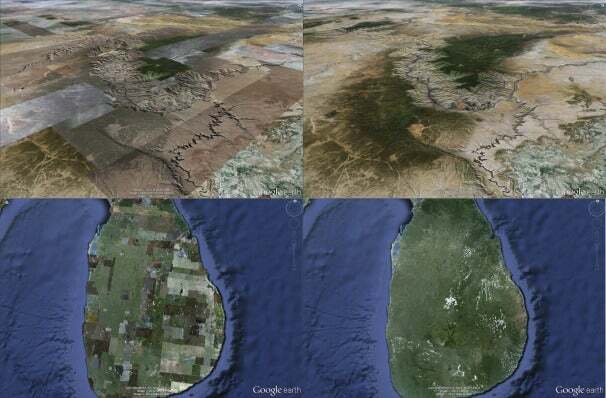 Photo ZOOM: The improved Google Earth rendering, before and after, top Grand Canyon and Sri Lanka below. Credit: Google. Google's new rendering engine smoothes out the quilt of images. “The end result is a beautiful new Earth-viewing experience that preserves the unique textures of the world’s most defining geographic landscapes,” explained in a blog post Peter Birch, Google Earth Product Manager. Version 6.2 of the desktop software is recommended for best viewing, he said. The Google Earth 6.2 update also borrowed the same autocomplete feature available in Google Maps, which makes it faster and easier to find the spot you are looking for. You can search by layers now, and biking, transit and walking directions are now available as well. There’s something new for Google+ users in the latest update too. There’s a quick option to share a screenshot of the current view on with your circles on the social network.